The Melting Pot is a restaurant chain that began in 1975, according to its official website. The restaurant focuses on fondue dinners with multiple courses. Because these fondues are cheese- and chocolate-based, they can be high in calories, especially if you are consuming multiple courses. Check nutrition facts carefully, especially if you're dieting. The Melting Pot's house salad is a low-calorie option, although it is high in fat. This salad contains 170 calories, with 11 g of fat, 6 g of carbohydrates and 11 g of protein. Although some fat is healthy, most of the fat -- 6 g -- in this salad comes from saturated fat. The American Heart Association recommends limiting daily saturated fat intake to 16 g, as this type of fat may increase your risk of heart disease. 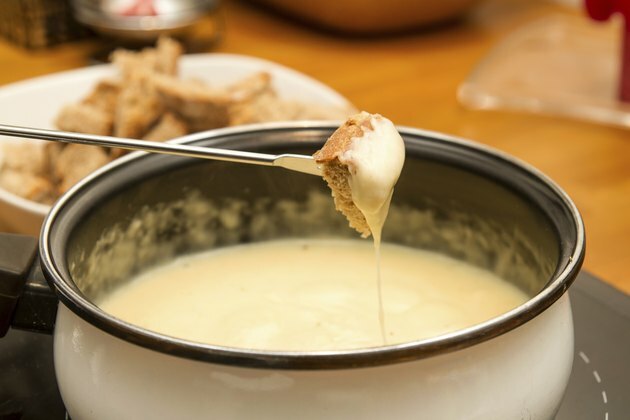 One of the traditional dishes at the Melting Pot is the Swiss cheese fondue. One full order of the Swiss cheese fondue contains 793 calories, with 51 g of fat, 34 g of saturated fat, 19 g of carbohydrates and 46 g of protein. Sharing this meal with one other person would reduce the overall calorie count to 396 calories, or 19 percent of the daily recommended intake of 2000 calories. The Fondue Feast is the highest calorie meal at the Melting Pot and is intended to be shared by two people. This meal includes salad, cheese fondue, chocolate fondue and assorted meats, vegetables and fruits. The entire meal contains 3630 calories, with 160 g of fat, 74 g of saturated fat, 351 g of carbohydrates and 143 g of protein. If you split the Fondue Feast with one other person, you will each consume 1815 calories, which is more than 90 percent of the daily recommended intake of 2000 calories. Coq Au Vin is a classic French chicken dish. This is one of the lower calorie choices at the Melting Pot, with 345 calories, 9 g of fat, 17 g of carbohydrates and 47 g of protein. The tropical salad is a fruit salad and the lowest calorie option at the Melting Pot. This dish contains 75 calories, 0.5 g of fat, 11 g of carbohydrates and 2 g of protein. Because cheese and chocolate are high in calories, it can be difficult to find diet-friendly choices at the Melting Pot. You can control calorie intake by using the cheese and chocolate dips sparingly, opting for lean meats -- chicken and seafood -- and sticking with fruit, which is low in calories.